Tag line: "Help is only 140 million miles away"
In a 1998 movie you might have heard of called Saving Private Ryan, a rescue party was sent out to find and retrieve a character played by Matt Damon. Seventeen years later, in the Ridley Scott-directed film The Martian, the actor once again portrays a guy in need of some assistance, only this time help will be coming from a lot further away! Damon plays Mark Watley, astronaut and member of the Ares III crew, which, as the movie opens, is busy exploring the surface of Mars. Their mission is cut short, however, when an approaching storm is detected, one powerful enough to tip over their escape module, the Hermes. To protect her crew, Commander Melissa Lewis (Jessica Chastain) orders everyone onto the Hermes for immediate departure, but as they’re making their way to the module, a satellite breaks loose and strikes Watley, carrying him hundreds of feet in the wrong direction. When sensors indicate that the collision punctured Watley’s suit, leaving him exposed to the harsh climate, Commander Lewis and the others, namely Major Rick Martinez (Michael Peña), Systems operator Beth Johanssen (Kate Mara), flight surgeon Dr. Chris Beck (Sebastain Stan), and navigator Alex Vogel (Askel Hennie), conclude that Watley is most likely dead, and take off without him. But Watley didn’t die, and, after making his way back to base, finds he’s been stranded on a planet that’s millions of miles from home. Knowing it will take four years for a rescue team to reach him, and figuring he only has enough food to last 31 days, Watley realizes the odds are against him. To make matters worse, he has no way of communicating with NASA, meaning that, even if he does conjure up some supplies out of thin air, nobody knows he’s alive, and therefore they won’t be looking for him. Back on earth, the officials at NASA, including head administrator Teddy Sanders (Jeff Daniels), Mars mission director Vincent Kapoor (Chiwetel Ejiofor), and Ares III mission director Mitch Henderson (Sean Bean), mourn the loss of Astronaut Mark Watley, then carry on with business as usual. In fact, it isn’t until over a month later, when satellite planner Mindy Park (Mackenzie Davis) notices some equipment has been moved at the Ares III site, that they realize Watley is still alive. With the help of Bruce Ng (Benedict Wong) and his team of engineers, NASA rushes to build a rocket that, at the very least, will drop off supplies to carry Watley through until the next scheduled Mars mission arrives. With media relations director Annie Montrose (Kristen Wiig) handling the press, NASA works tirelessly to bring their lost son home, but they’re going to need plenty of outside help, and more than a little luck, to accomplish what seems like an impossible task. A reliable actor, Damon shined in movies like Good Will Hunting (which he also co-wrote with Ben Affleck), The Departed, and the Bourne series, yet in The Martian, he gives what may be his finest performance, playing a character as witty as he is intelligent (despite the situation, he never loses his sense of humor), and, in the process, makes the hopeless seem possible (Watley’s ultimate solution to the food problem is both ingenious and a little gross). 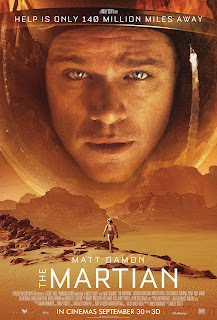 Unlike Saving Private Ryan, where his character doesn’t even appear until the final act, Matt Damon is front and center through most of The Martian, and, while his supporting cast is also exceptional (especially Chastain, who’s absolutely believable as the Ares III commander), he is brilliant in what, at times, amounts to a one-man show. This, combined with awesome special effects (the Jordan desert is convincingly transformed into the surface of Mars), a story that’s brimming with tension (you’ll be on the edge of your seat the entire time), and the sure hand of Ridley Scott to pull it all together, results in an unforgettable experience. The Martian is a big-budget spectacular done right.